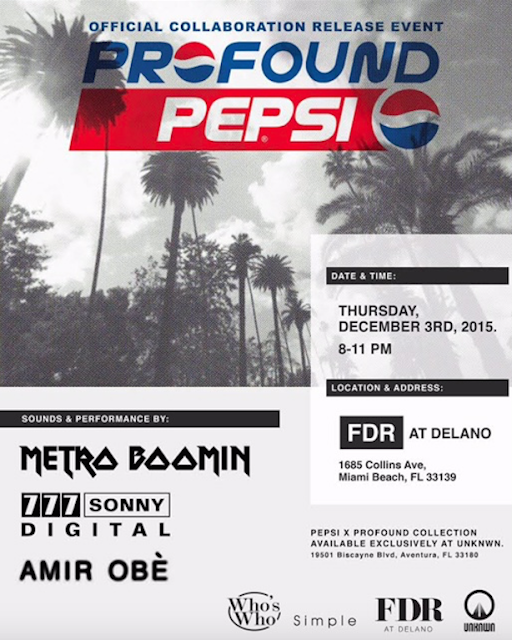 #ArtBasel2015 | Thursday, December 3rd Official Collaboration Release Event presents Profound Pepsi at FDR at Delano ~ Phresh Hott New! On Thursday, December 3rd Official Collaboration Release Event present Profound Pepsi at FDR at Delano. Sounds by: Metro Boomin | 777 Sonny Digital | Amir Ore | + More! Do you need an rsvp for the event?